Day In The Life Of A Location Shoot. This behind-the-scenes shot on location with photographer Gavin Bond reveals the need for lighting that can go anywhere and do anything. Multiple lights were used to create the look the client requested, and the results can be seen in our profile of Gavin Bond in our sister publication Digital Photo Pro in the September/October 2017 issue. Editor’s Note: This piece first appeared in our Fall issue and reflects the products available at the time of publication. To see our coverage of the latest gear, visit our News section. You also can check out “7 Lighting Solutions For Photo And Video” for some of the gear we’ve recently reviewed. While studio photography has a large assortment of lighting and grip equipment at the ready, photographing on location with strobes or continuous lighting kits tends to put the photographer in a run-and-gun mode, where they have to get carefully selected and packed portable setups into position quickly to get the shot under ever-changing conditions. My goal when using artificial light is to get the most out of the subject, whether it’s by softening shadows or creating harder ones in a realistic way. Lighting on location is a balancing act of existing ambient light and what you introduce into the scene. If done well, it can add to or save a shot; if not, it can have just the opposite effect. Since it’s not always possible to be at the right place at the right time in terms of ideal ambient light conditions, the use of a flash can reduce or eliminate unwanted harsh shadows or create dramatic ones, depending on the desired outcome. While speedlights are lighter and more portable than monolights and power packs with separate heads, they offer less power and slower recycle times than their more powerful relatives. For more power, many photographers opt for the Quantum Qflash TRIO (QF8), which is part speedlight, part monolight. 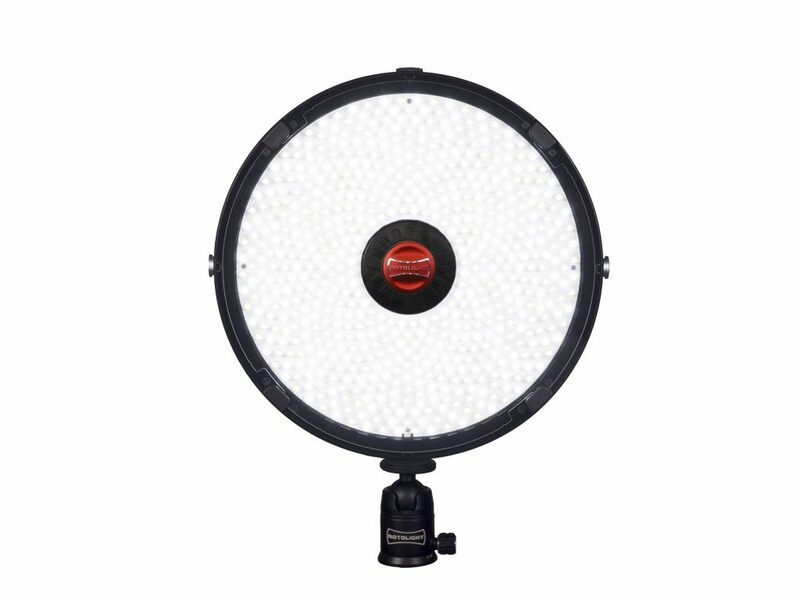 It’s bigger and more powerful than the average hot-shoe flash and has a built-in parabolic reflector with a diffuser. The battery-powered unit is available with built-in TTL wireless receivers for Canon and Nikon systems, and can control all the same features, including AF assist, high-speed sync and the ability to adjust the settings and output of remote flashes from the command center of the primary unit. For more power and light-shaping options at locations that don’t have easy access to electrical outlets (e.g., the beach), monolights—self-contained strobe units powered by a large rechargeable battery—are the obvious choice. When it comes to the balance of power with portability, the Profoto B1X (500) strobes are among the best solutions on the market in terms of location photography. With 10 times the power of the average speedlight, its exchangeable lithium-ion battery, which mounts directly onto the strobe unit, will yield up to 325 full-power flashes and well into the thousands at lower power when fully charged. 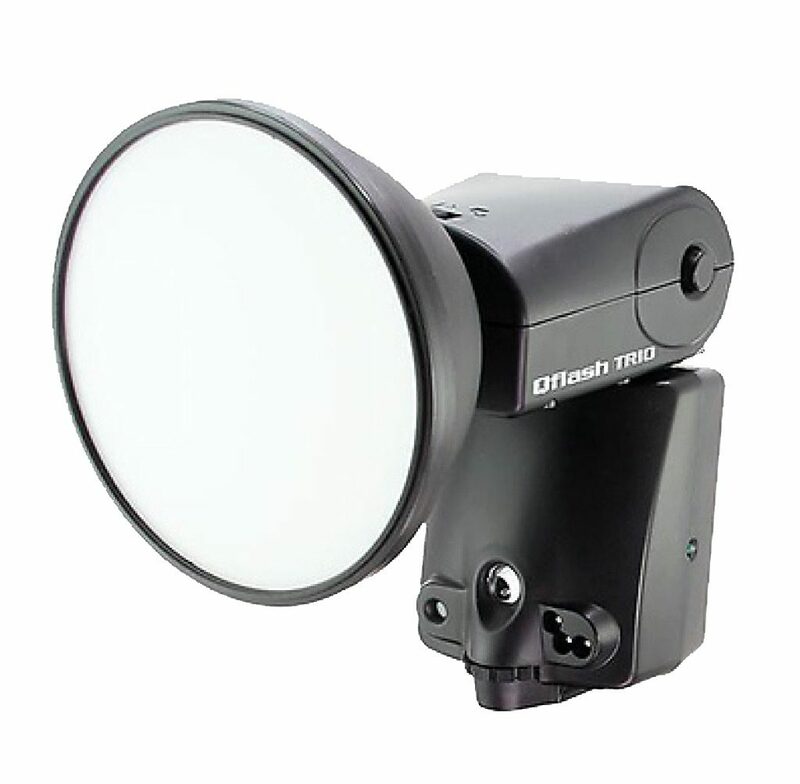 This cordless, battery-powered off-camera strobe can work in the TTL (through the lens) mode utilizing the optional Air Remote TTL-C (for Canon), TTL-N (for Nikon), TTL-S (for Sony) or TTL-O (for Olympus) transmitter. More accurately described as a controller, the transmitter slides into the camera’s hot-shoe, has eight frequency channels with three groups per channel and a range of up to 330 feet for TTL triggering and 1,000 feet for normal triggering. Each channel has a power ratio capability of +/– 2 stops. The flash unit has an LED modeling light and first- or rear-curtain control. The Air TTL can quickly be adjusted for the appropriate exposure in 1/10th ƒ-stop increments over a nine ƒ-stop power range. To go wireless with other strobe systems, most pros turn to the PocketWizard Plus II radio transmitters. 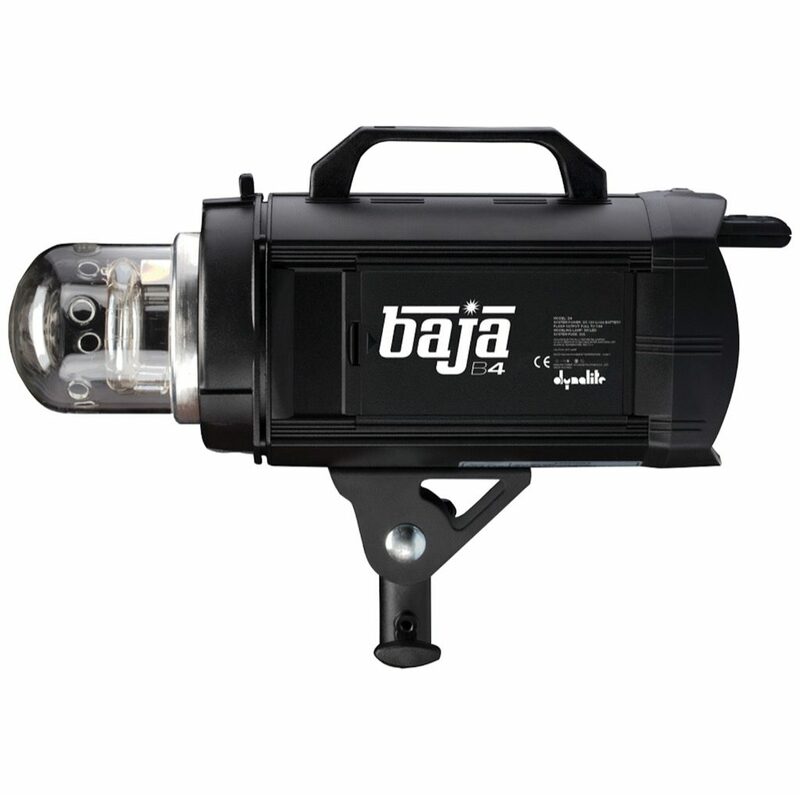 The Dynalite Baja B4 is a 400w/s monolight with six stops of range, adjustable in tenth-stop increments. The rechargeable lithium-ion battery is enough for 550 full-power flashes, and the flash duration ranges from 1/500th to a fast 1/12,800th of a second when freezing superfast action is called for. Its C-Mode offers burst shooting up to 15 flashes per second. Bowens’ entry-level Gemini 400Rx 400w/s monolight keeps the major features of the company’s more powerful offerings. This ultra-compact Gemini model has a built-in Pulsar Radio Trigger receiver, Travelpak battery compatibility, five-stop power variability and 250W modeling light. The Einstein E640 from Paul C. Buff offers high-end features in a relatively affordable package. The 640w/s monolight has all-digital controls and an LCD display, as well as precisely adjustable power across a nine-stop range (from 2.5w/s up to the full 640w/s) variable in tenth-stop increments. 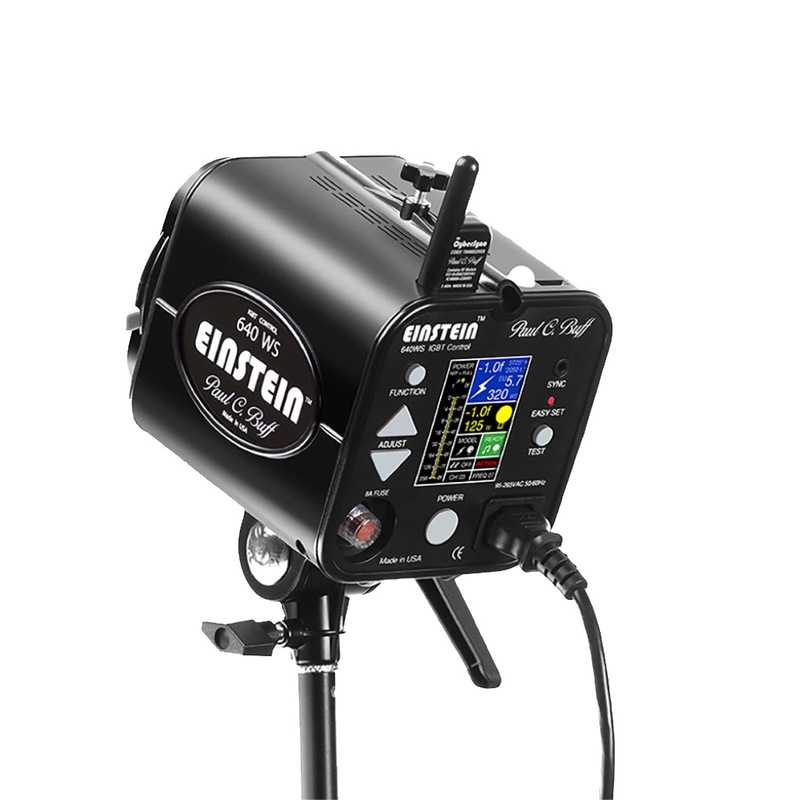 The Einstein is particularly known for its short flash durations, ideal for strobing fast-moving action. It also offers color consistency via the selectable Constant Color mode—useful when perfect color accuracy, vital for applications such as catalog photography, is a must. 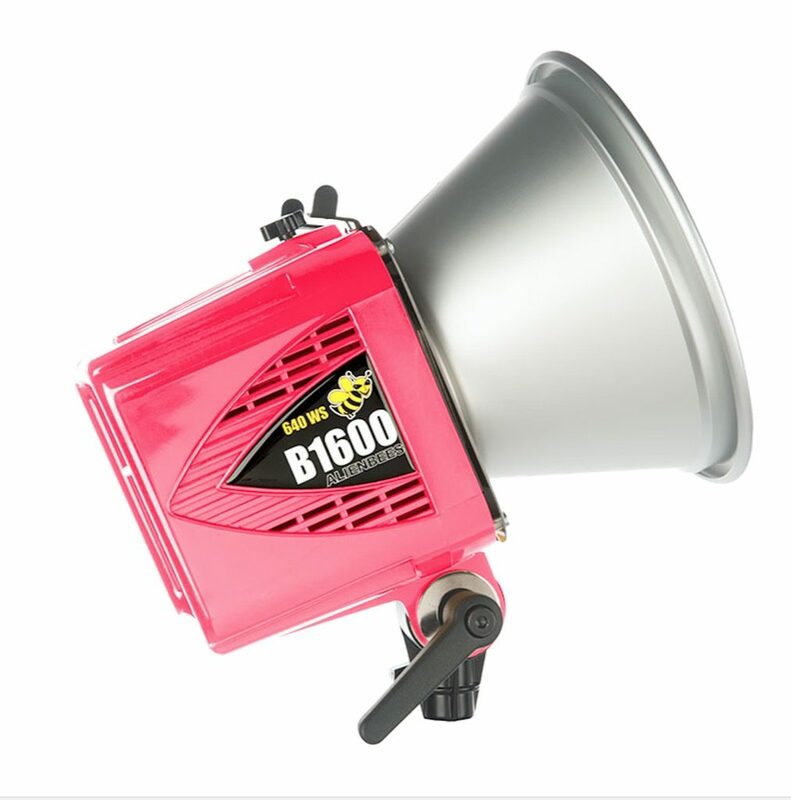 The AlienBees B1600, also from Paul C. Buff, is a monolight flash unit that has adjustable output from full power (640w/s) down to 1/32nd of the total power (20w/s). The flash power is adjusted on the back control panel with a slide fader, capable of adjusting in whole ƒ-stop increments and everywhere in between. The 150-watt modeling lamp can be set to full brightness, turned completely off or set to track the power changes. The B1600 comes with a sync cord for plugging directly into a camera, as well as a built-in slave tripper to allow wireless firing. It also has a standard 120 VAC (50-60 Hz) 15-foot power cord to connect to a standard, grounded outlet for power, making it a unit that feels just as comfortable in a studio environment. 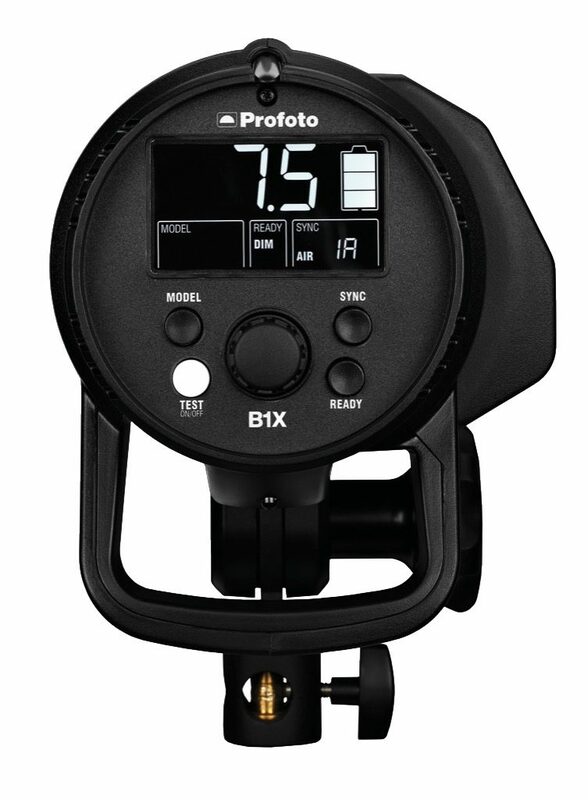 Another monolight that can double as a traditional plugged-in strobe is the Phottix Indra500. This 500w/s strobe can be powered by an AC outlet or from the included 5,000 mAh battery, which can produce 400 full-power flashes on a single five-hour charge. The Indra500 also offers TTL metering and second-curtain sync, thanks to built-in wireless receivers for Nikon and Canon cameras. The Indra500 also has a built-in PocketWizard receiver. 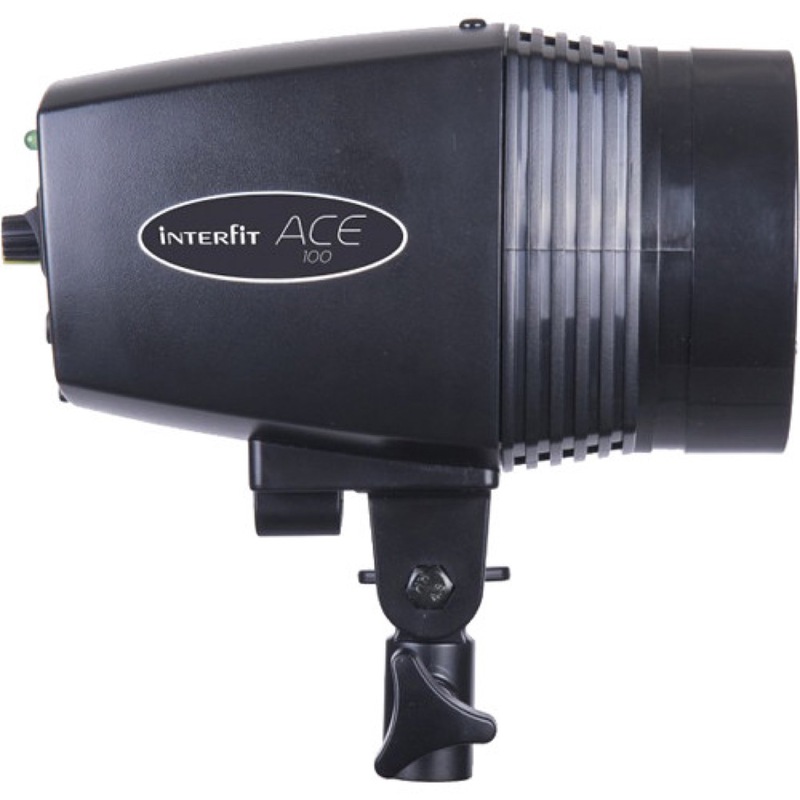 For easing into the world of non-speedlight strobe photography, the Interfit ACE 100 Ws Flash Kit provides the basics for under $100. 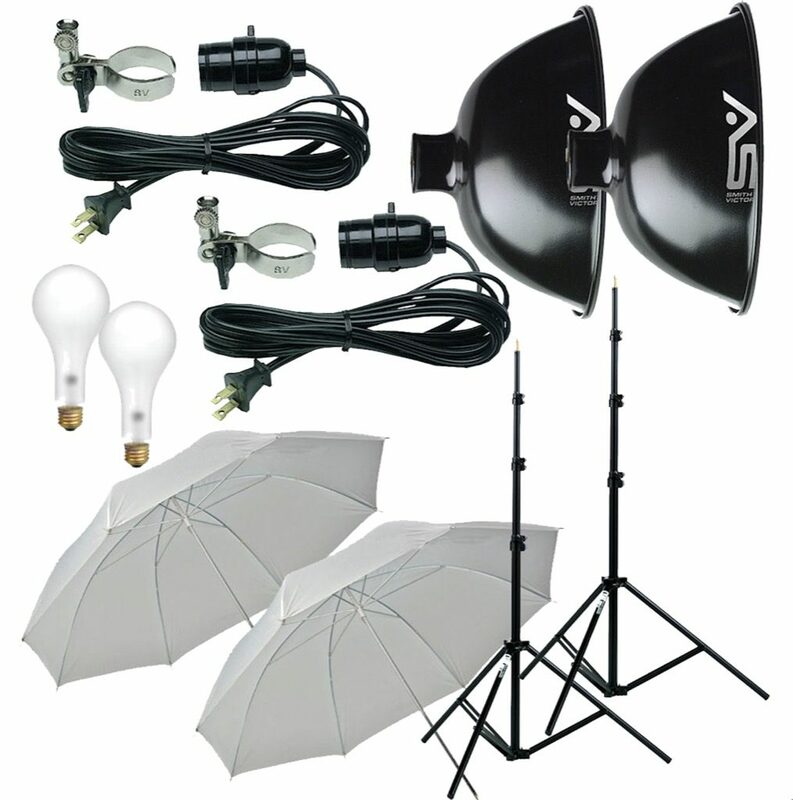 The kit contains an ACE 100w/s monolight with manual controls, stepless power adjustment across a four-stop range and a built-in optical slave and sync port, as well as a light stand and an umbrella for softening the strobe’s output. The saying goes that a journey of a thousand miles begins with but a single step. This kit might be the ideal photographic lighting equivalent. My first foray into studio lighting was with two Smith-Victor lights with a couple of 250W blubs. While I’ve moved up through the ranks to state-of-the-art strobes, I created a solid foundation in terms of lighting techniques with these simple but dependable light sources. Today, Smith-Victor offers a similar kit—the KT500U 2-Light 500 Watt Thrifty Basic Umbrella Kit—for those who want to work with a continuous lighting setup for either still photography or hybrid video shooting. These days, lightweight and compact LED lighting solutions like those made by ikan, Litepanels and Lowel have become the hybrid-video equivalent to carrying around a flash for still shooting. All have dimmers to vary the output. The diminutive Litepanels MicroPro 2 replaces the previous (recommended) Micro Pro and now uses the most recent surface-mount LED technology for accurate color rendition, and it can run for more than an hour on AA batteries or a Sony L-type battery. A DC input jack located on the back of the unit allows for working with an external power source. Included gels and diffusers let you adjust light output. Quality meets affordability in the Onyx 15W and 30W bi-color LED lights from ikan, with the equivalent to 100 and 250 watts of incandescent light, respectively. Housed in a lightweight durable aluminum frame, the on-camera lights are adjustable from 3200K-5600K. The 15W can attach to a camera or ¼” tripod; the 30W can attach to a camera or ¼” tripod, or any stand with a baby 5/8” thread. Both weigh less than a pound. They use Sony L Series batteries. Powered by AC or by battery, the Lowel Blender with a 4x3x3-inch lamphead is another option. It has two sets of LEDs in tungsten and daylight color in one unit, which can be blended to match mixed-light sources by dimmer controls on the back of the unit. It comes with a set of front diffusers for softening light output. Westcott’s Skylux LED looks like a monolight strobe, but it’s actually a continuous lighting source. Its daylight-balanced output works well with strobes (which are also daylight-balanced). Output is equivalent to a 1200-watt tungsten bulb and dimmable down to 30% of its power. Its built-in parabolic reflector has a 60° spread. Companies such as Gary Fong, Lastolite, LumiQuest, Westcott, Fstoppers and Sto-Fen have a wide array of light-shaping products specifically made for digital SLRs and mirrorless camera flash systems, while a number of these, as well as all the major strobe manufacturers, make them for their larger strobe heads. Many of the latter are interchangeable, while some, especially speed rings for mounting softboxes to a strobe, are not. My go-to modifiers for my speedlight are the Gary Fong Lightsphere Diffusion Dome, which creates a soft, omni-directional fill light, and a Gary Fong black Speed Snoot Collapsible with a grid for more focused, and therefore, more dramatic, results. For my monolights, I most often turn to Profoto’s collapsible 2-foot beauty dishes and grids, which come in a number of degrees. The smaller the number, the more concentrated the light. If the setup requires several strobes, I might use one or two beauty dishes to illuminate the subject, grids to light the hair and others to illuminate key elements in the background. While the variations are almost limitless, professional photographers tend to gravitate toward certain setups that give our work a unique “look” or style. Now we take on the question that most people—including some pros—like to avoid: What is the current ambient color temperature? Understanding the color of light in terms of the Kelvin temperature scale and making the proper adjustments will make your images much more professional-looking. Color imbalance and over-lighting a subject are two of the most common misuses of flash that separate professional from amateurish-looking photos. For indoor scenes, I like my lighting to basically replicate the direction and feel of the existing light sources while giving me the added ƒ-stop, shutter speed, fill light and color balance needed for a given situation. The Kelvin scale was created by Belfast-born British physicist, mathematician and engineer William Thomson, coming down through history as Lord Kelvin. While he wasn’t thinking about photographic applications when he invented his absolute thermometric scale in 1848, Kelvin gave the photography world a consistent way to interpret and quantify the color of light. This is vital for manufacturing accurate and repeatable lighting equipment and color films, attaining digital white balances and so on. As part of his research, Kelvin heated a block of carbon, noting the progression of its color from red to yellow to a blue-white at the highest temperatures. Basically, higher color temperatures (5000K or more) are cool (bluish-white) colors. Color films are calibrated to this scale, with daylight typically being 5600K and tungsten 3200K. When I did the stills on “The Merv Griffin Show”—I’m dating myself—I loaded my cameras with tungsten-balanced film, which, because of its extra blue shift, balanced out the yellow of the tungsten lights typically used for movie and television productions. These days, a quick adjustment of the white-balance button to the tungsten setting on a digital camera is all it takes. The symbols on digital cameras (a lightning bolt representing the FLASH setting, the sun representing DAYLIGHT, a light bulb symbolizing TUNGSTEN) also relate to Kelvin color temperatures. Processing software, such as Adobe Lightroom and Adobe Photoshop, have sliders with Kelvin temperatures to fine-tune color. If you want to take full advantage of color-correction options, shoot in RAW. Photographs that have mismatched color temperatures look amateurish. For example, a flash without any color correction shot around noon on a bright day to fill in or soften shadows on a person’s face might work well, but that same flash at the same location shot toward sunset will have a color imbalance unless its color is corrected. The color of light changes throughout the day, ending with warmer color temperatures on a clear day or with cool bluish tones under overcast skies. What’s the solution? Color gels. Kelvin color temperature to 5000K. Remember, the two most important degrees on the Kelvin color temperature scale when it’s applied to photography are 5600K for daylight and 3200K for tungsten. If you keep these numbers in mind and comprehend what they stand for, chances are, you can get close to a good color balance on your first effort. I’ve found over the years that most of the color adjustments are done to warm up my flash. Since flashes tend to be balanced/calibrated to the cool side of daylight—5600K or higher—having some CTO gels in varying strengths in my bag is a must. While CTOs are the most important gels to have in your bag, they’re not the only ones to pack if appropriately lit and properly color-balanced images are the goal of your flash work. Imagine a scenario where you’re in a snow-filled scene where the cold is penetrating every layer of your clothing. To get that feeling across, warming up part of your scene with a CTO in a very bluish ambient light situation would look artificial. Going the other direction by using a CTB gel might be the best solution. As we saw with CTOs, every 1/4 represents a shift of 600K. If you’re just going to use the existing light in a fluorescent light-lit space, you can simply set your camera’s white balance to the fluorescent symbol. But what if you want to do a portrait of a person in that location and decide that employing your flash for the job will yield a better result? If you fire your flash with the camera’s white balance set to fluorescent, your environment will be correctly color-balanced, but your subject’s flesh tones and clothing will be off. If you fire the flash with the camera’s white balance set to daylight or flash (the lightning bolt symbol), your subject will have a correct color temperature because their primary light source is the flash, but the environment will be green. This is a classic mixed-lighting situation that takes time and effort to correct in post-production. The solution is to set your white balance to fluorescent and add a green gel over your flash head so its output will match the ambient light of the overall scene. A number of companies, including Rosco, LEE, Profoto, Elinchrom, Dynalite, Pro Gel, Gary Fong, LumiQuest, Westcott, Fstoppers and Sto-Fen, make gels and products specifically designed to keep you (or at least your lighting) in balance or to create special effects. Of course, we often don’t want to neutralize all colors—some scenes, such as a candlelit dinner, should have a lot of warmth, while a mid-winter high Arctic scene should come across as ice-cold. It’s important to understand when discussing daylight and tungsten that there’s no one daylight Kelvin temperature and there’s no one correct tungsten temperature. For example, a candle flame is approximately 1850K, and incandescent light bulbs typically fall into the 2700K-3300K range. Daylight and electronic flash units range from 5500K to 6000K, with an overcast day going toward 6500K. In addition, daylight color temperatures change throughout the day. Other factors such as weather and location—snow, sand, altitude—come into play. For example, your eye sees blue when it sees snow on a sunny day, but your brain thinks white, discounting the sky’s reflection. The photograph will reflect the reality, not what’s in our mind’s eye. Shooting with a straight flash with its cool color temperature might be perfect for that but completely off for a sunset. This is when adding gels in front of the flash is the solution. My shoot with actor Jeremy Piven on location in Malibu required a dramatic sky in the background, but the time allotted for the shoot was earlier in the afternoon than I would have liked, the sun still being somewhat high in the sky. I needed to bring my power up and the sun down. With a full CTO over the flash head in a large softbox on a C-stand weighted down with sandbags, I used a Hasselblad H2 syncing at 1/1000 sec. with its leaf shutter and got my ƒ-stop down to ƒ/13, which gave me the drama I was looking for. For this bigger type of production, I work with assistants. While we can use presets, such as sunny, cloudy or tungsten, and adjust white-balance values in Kelvin on professional cameras as well as shoot in RAW and adjust color in post with a simple preset or slider, none of these will correct a color imbalance if the image has mixed light sources, e.g., tungsten and daylight. Correcting the image in post requires time and effort. I’d rather use the time creating imagery rather than “saving it” later. It’s better to get it right in the initial capture. Digital cameras, because of their immediate feedback, have been an incredible aid to photographers working creatively with flash. Flash fill has given us the ability to extend working hours so we can shoot even under the midday sun, which, according to playwright and composer Noel Coward, was supposed to be the domain for only mad dogs and Englishmen. My still photo assignments dictate my lighting kits. While every situation is different, I’ve found four basic categories: speedlights for when I’m on the go for reportage assignments; monolights when I need more power but plugging in is either impractical or impossible; power packs and separate heads for editorial and advertising jobs where I need total light control with multi-light setups and the power to get down to small ƒ-stops; and continuous lights for DSLR video. In all four cases, my kits will include modifiers to control the light. After all, if you don’t control the light, the light will control you.